Homemade Baby Formula: Is It Really Safe? One of the things Green and Growing promotes is making items, growing food, and learning to do other tasks yourself. The world of do-it-yourself, homemade items is generally easier on your wallet and less harmful to the environment. If you search for a homemade baby formula online, you can easily find a plethora of available recipes. Perhaps you have heard that doctors advise mothers to avoid using homemade baby formula. If you want to know if DIY formulas are safe for infants, keep reading to find out. By far, the best source of nutrition for infants is breast milk. Not only does breast milk offer the best combination of nutrients, but it also changes to meet the needs of the baby. On top of all of that, breast milk is also full of antibodies that help babies develop a strong immune system. Nursing mothers also benefit from breastfeeding because the act helps shrink their uterus and help them return to their pre-pregnancy size. In reality, not all mothers have the opportunity to exclusively breastfeed their children for the recommended six months. This can arise from health issues, but some mothers also make the choice to not breastfeed. Either way, a baby can still grow and develop normally without breast milk. Is Homemade Baby Formula Safe? When you look at the ingredients on baby formula, you probably will not know what all the ingredients even are. The long scientific names are difficult to understand unless you are a scientist yourself. This causes many mothers to want to try a homemade baby formula instead. This way, they know exactly what ingredients they are giving to their baby. In many instances, this is a perfectly safe and logical solution. In the case of homemade formula, it is not. Homemade baby formula is not safe and you should not give it to your child. Here are the three main reason why. Breast milk is incredibly complex and constantly changing, which is why it is the best source of nutrition for infants. Mother’s bodies know exactly how to help and feed their child, so this is an obvious choice. While commercial formulas are the next best option, even they cannot match the complexity of breast milk. If you look at a handful of DIY formula recipes online, many of them call for cow’s milk or goat’s milk as a base. While most people can drink these kinds of milk without any problems, infants have a hard time digesting them. These types of milk have more nutrients than infants need and not enough of certain nutrients. It is also absolutely crucial for you to use the exact measurements for the formula to be safe. By using homemade baby formula, you risk giving your child the improper balance of nutrients. This can lead to malnourishment, excessive weight gain, and a slew of other medical complications. Another risk you run into when using homemade formula is contamination. Because you are making the food yourself, there are not any regulations in place to guarantee the formula is free of contaminants. You have to buy all the ingredients yourself, which leaves the risk of unsafe manufacturing practices. When making the food in your kitchen, there is also the risk of bacteria and other contaminants on your countertop, storage containers, utensils, and etc. There really is no way to ensure your homemade baby food is safe when you make it yourself. As mentioned earlier, many of the ingredients listed in homemade formula recipes are not safe for infants to eat at their age. Some recipes call for raw cow or goat milk, and no one—even adults—should drink raw milk. This increases your risk of exposure to E. coli, Salmonella, and Listeria. You should not even give an infant processed milk from the grocery store until they are a year old. As also stated before, many of these ingredients also do not provide the proper nutrients that babies need. Why Should You Use Commercial Formula Instead? For once, we advise you to avoid DIY formula for your infant unless you talk to a doctor and nutritionist to approve the recipe. They need the proper nutrition and ingredients that you cannot accomplish by yourself. If you want to give your child formula over breast milk, stick to the commercial brands at the store. They are much safer and most closely resemble the nutrition breast milk offers. We will expound on our reason for choosing commercial formulas over homemade formulas. We have already stated that breast milk is the best food you can give to your child, but a close second is a commercial formula. They contain the right amount of all the nutrients your child needs to grow up healthy and strong, as well as vitamin D. Mothers who choose to breastfeed have to give their infant vitamin D supplements, whereas formula provides it in your baby food. Commercial baby formula brands have extremely safe and sterile manufacturing processes because the FDA heavily regulates them. Once a year, a representative from the FDA inspects each company’s manufacturing facility. They even collect and analyze samples from each facility to ensure the formula meets each of their regulations. These formula brands also spend millions of dollars on research to make sure their product offers the right nutrition for your baby. This also includes their soy formula, hypoallergenic formula, and other kinds of formula for different sensitivities. Some formula brands even offer an organic option so you can give your child the best ingredients possible. Unless you have a doctor and nutritionist approve of your homemade formula recipe, you should not try it. Even if a doctor does approve it, you should regularly take your child in to be tested for any deficiencies. 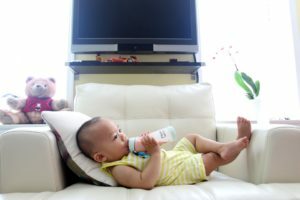 Homemade formulas can lack the nutrients your child needs, which will prevent them from growing and developing properly. Instead, use commercial formula brands. They are FDA approved and have all the right nutrients your baby needs.